that thrill us, comfort us, help us now? My book’s notes tell me that Linos was “a vegetation god similar to Adonis” and that the one mourning Linos was likely Orpheus, “the legendary first poet and musician.” So music and, by extension, art, comes from grief, suffering, and death. Music has made the “emptiness vibrate.” There is no angelic order to comfort us, and there is nothing but silence and the voices of the dead to help us face death, but there is, in consolation, the beauty of music. All this is a question, though — the speaker wonders if the old tale of Linos and Orpheus is pointless after all. As I began to work on the Elegies I found that the long lines of the original were difficult to reproduce in English (or, more strictly speaking, American). Read aloud, they sounded fine; the listener could follow in the reader’s voice the emphases, hesitations, and variations in speed. On the page, however, the long line did not readily suggest the “living” quality, and was one of the features most likely, I came to feel, to make the poem seem like a museum piece. Williams’s triadic line worked for him because “a long line made up of three shorter, overlapping units makes an extremely flexible instrument of expression. The more I have worked with it, the deeper my respect for it has grown.” I feel that perhaps I shouldn’t like this because it’s messing so much with the original, but, then, translating a poem necessarily means messing with it, and I do like reading the poem in short lines; it’s got a flow to it that’s a pleasure to follow. Two other translators of Rilke, Edward and Vita Sackville-West, wrote this about Rilke’s lines, that they are like “an immense road, admitting many thoughts and images abreast of one another, and seeming to suggest movement in more directions than one,” and I think Young’s translation captures this well. I have never read Rilke, but I think I would like to. I am forever looking for the poetry that I can connect with! How interesting – I should look out the new translation. I adore these poems as you know, and it makes me very happy to think they’ve given you pleasure too. I just love the way he writes. 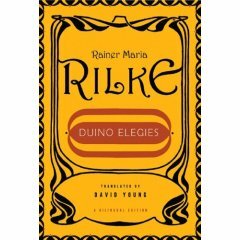 I haven’t read much of the Rilke, Danielle, but so far it’s going very well, and I highly recommend it! Litlove, yes the translation is interesting — I’d like to compare it to others at some point, to see what difference his choice of form makes. I’ve only read Rilke’s Letters to a Young Poet. I’ll have to try his poetry sometime. Now those Letters would be interesting — I’ve sort of had them in the back of my mind for a while. I shall have to check them out at some point. I picked up a copy of Duino Elegies after reading The Time Traveller’s Wife – snippets and couplets kept making an appreance between chapters, and the language was beautiful. Pick up a copy of Stephen Mitchell’s translations of Rilke. For my money, Mitchell’s translations are both the most musical and the most mystically informed. For example, he starts the first elegy with “Who, if I cried out, would hear me among the angel’s hierarchies?” I just find that so much more palatable on the English tongue than any other translation. If you want more about the problems/complexities of translating Rilke, check out William Gass’s fantastic Reading Rilke: Reflections on the Problems of Translation. any idea where one might find the sackville-west translation of the duino elegies? I too picked up Rilke after reading TTW – amazing intertrextuality in this book, and the cultural references are great; I also got really into the Violent Femmes as a result of Henry and Clare’s concert-going antics. this seems a very Baudelairean idea, of beauty and ugliness being linked, and of the terrifying and ugly being made beautiful through description of it.